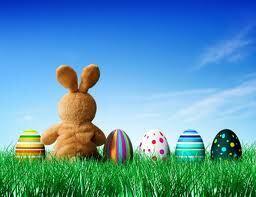 Sunday Salon - March in a Nutshell - Happy Easter! Happy Sunday, Happy Spring, Happy Easter (to those who celebrate) and Goodbye to March. How was your week readers? It finally feels like Spring may be in the air. 50's for the last few days which may not seem like anything for me to brag about to those of you who live in warmer areas, but this has been one heck of a long winter. 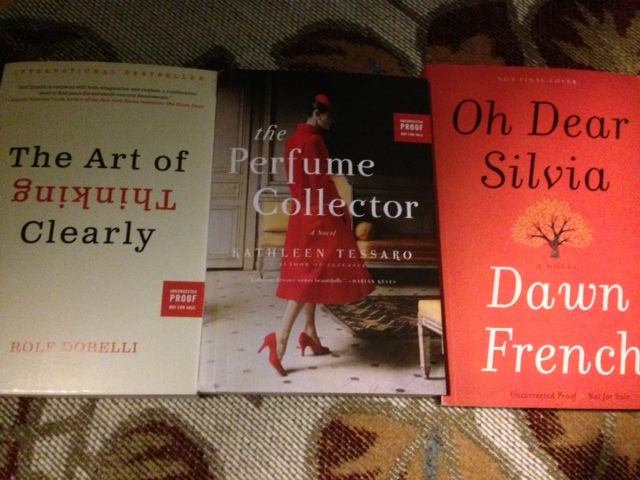 I have a couple of books that I finished and haven't reviewed yet. One was American Psycho which several bloggers read and reviewed several months ago. What can I say that hasn't been said about this novel and Patrick Bateman? First, I listened to the audio book, which I feel funny about saying this, but I loved it, and I was never bored with the story for even a minute. 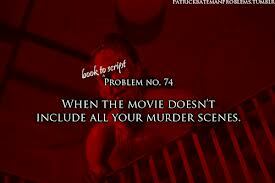 For readers unfamiliar with the story, Patrick Bateman, the 27 year-old, "American Psycho" narrates the story. He's good looking, brilliant, attended the best schools, is incrediblyy vain, obsessed with fitness, designer brands and having the best of everything. He lives in Manhattan, in the same building as Tom Cruise, and will even prattle on about the $60 pair of boxer shorts he is wearing. He even feels compelled to tell his secretary at Pierce and Pierce, where he is a hedge fund Vice President, what she should and should not wear. It's easy to see from the very beginning that he doesn't have any moral compass, but it's much worse than that. He hates blacks, gays, poor people, people of authority and women. Bateman hangs out with other pompous buddies. They meet for drinks, dinner at the finest places in NYC and together they drone on about fashion and they critique everyone in their circle of vision when together. His buddies may be idiots, but they have nothing on Patrick as far as who the 'psycho" is. The story gets violent quickly with graphic depictions of more than a dozen murders he commits: men, women, a child and even a few animals. He uses knives, drills, nail guns, chain saws, lighters, coat hangers to harm and kill his victims, in the course of the (14) hour audio rendition. Definitely not for the faint of heart, but really well-written and a character I will never forget. So after I finished the book my husband and I watched the 1.5 hour movie version, which was good, but disappointing after listening to the novel. Although the book was bloody, violent and equally graphic, the book paints even a darker picture of just how twisted this guy is, but honestly, parts are even laughable if you can imagine that after what I've told you. There is less of everything in the movie: fewer murders, less time in clubs with his buddies, less of everything, but it still follows the book pretty closely. 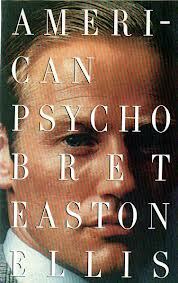 I think that the movie made me think that many of the the violent acts that I thought really happened in the novel might really have just been imagined or hallucinations by our American Psycho after all. I'd be curious to get other readers take on this. 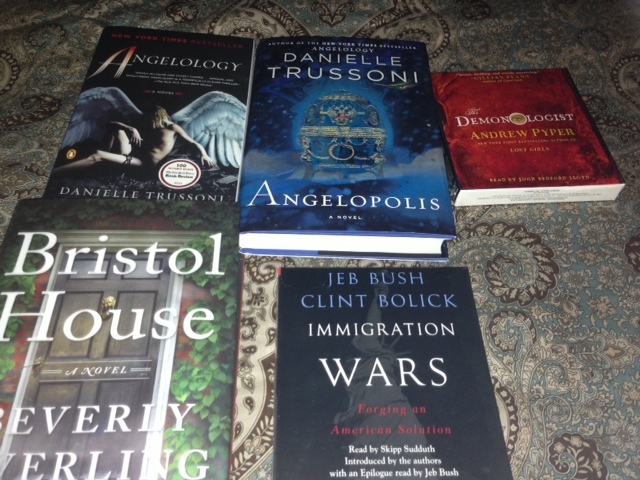 I read (12) books in March, but (4) were pretty short. I still need to review the last (3) that I read. 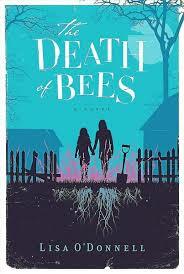 This isn't a spoiler as from the very first pages readers learn that two young girls, Marnie and Nellie, 15 and 12 have just buried their parents.....in their back yard! "Eugene Doyle Born 19 June 1972. Died 17 December 2010, aged thirty-eight. Neither of them were beloved." The sisters live in a poor area in Glasgow Scotland, and grew up with abusive and frequently absent, drug addicts for parents. They decide it's best not to report their parents deaths as they don't want to be separated and risk having to go to yet another foster home. Marnie, the older sister is the primary narrator of this story. She's street smart and one tough wounded child, who hangs with the wrong crowd. 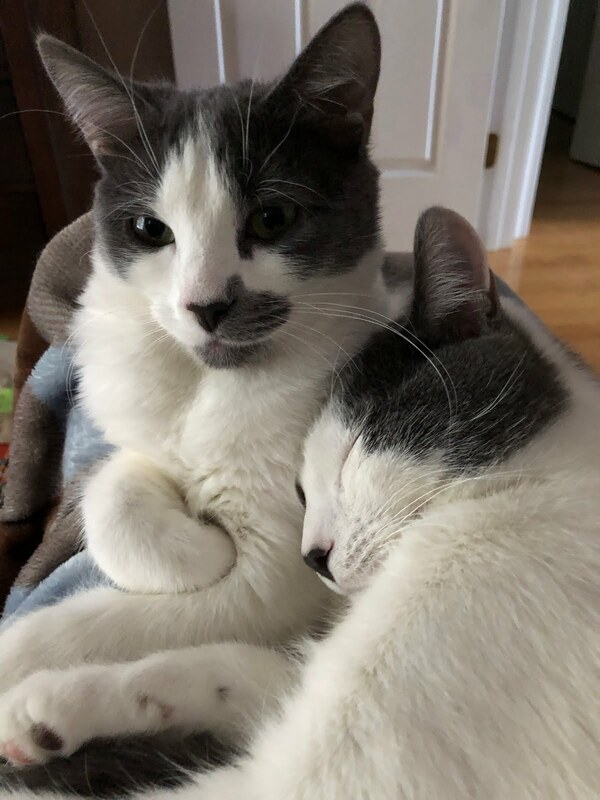 She is very protective of sister Nelly. You can tell when you first hear Nelly's voice that she's intelligent, but something isn't quite right. It seems she may have Asperger's Syndrome, but you never know for sure. The girls have a sweet man named Lennie, living next door to them; he is concerned about the girls. Lennie is grieving the loss of his gay lover, and the fact that he's considered to be a sexual predator, after propositioning a gay man who turned out to be under the age of consent, has nothing to do with concern for the girls. Lennie's a bit strange, but a kind man. He notices that things aren't quite right with the girls when he sees them spending a lot of time digging in their back yard one December. He hasn't seen their parents, but this wouldn't be the first time they took off leaving the girls on their own. Lennie invites Marnie and Nelly over for meals and watches over them. The girls make up excuses for their parent's absence. The story is told in short chapters by Marnie, Nelly and Lennie. Although it's a sad story, it seems so "out there" that if was hard for me to feel sorry for the girls at times. It was still one of those stories that kept me engaged, was fast paced and even better, it had an ending I didn't expect. For anyone who enjoys a book that is part YA, a bit mystery and also has a different look at life, I’d recommend this book! A gunman in a school, every parents worst nightmare is the basis for One Breath Away. From the very beginning, readers will be reeled into the story knowing that something very wrong is happening at a school in Broken Branch, Iowa. There is an unknown gunman in the school, but who he is or what are his motives are unknown. The story is told in short chapters by several different characters: Holly, the mother of (2) of the children: Augie and her younger brother P.J. ( Holly is recovering from serious burn injuries miles and miles away and the children have been staying with their grandfather). The other characters are Mrs. Oliver the teacher, a female police officer and the children's grandfather, Will. Through the changing narratives the reader learns more and more about the background of the individuals and insight into who the gunman may be as well as what his issues are. The author uses a technique similar to Jodi Picoult's style - short chapters and different perspectives. Some readers mentioned that there were lots of twists and turns along the way, and that they had no idea who the gunman was, while I had the gunman pegged pretty early on. 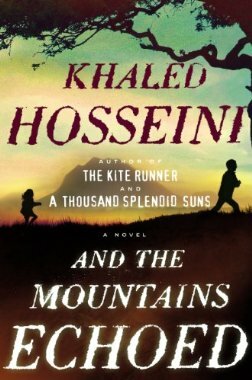 I didn't enjoy this one as much as other readers, and I think I may have felt differently if I read the book instead of listened to it. There were (4) different narrators for this book: Joyce Bean, Susan Erickson, Kate Rudd and Buck Schirner, and honestly for a variety of reasons they attributed to my lack of enjoyment after a while. I would recommend this novel but not the audio version. I would still be willing to try other books by this author, just not audiobooks. 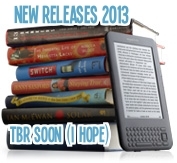 "Waiting On" Wednesday is a weekly event, hosted by Jill @ Breaking the Spine, that spotlights upcoming releases that we're eagerly anticipating. This week's pick is one that I'm hoping to get a sneak peek at. Every Tuesday I host First Chapter First Paragraph Tuesday Intros, where I share the first paragraph or (2) of a book I am reading or thinking about reading soon. Care to join us? 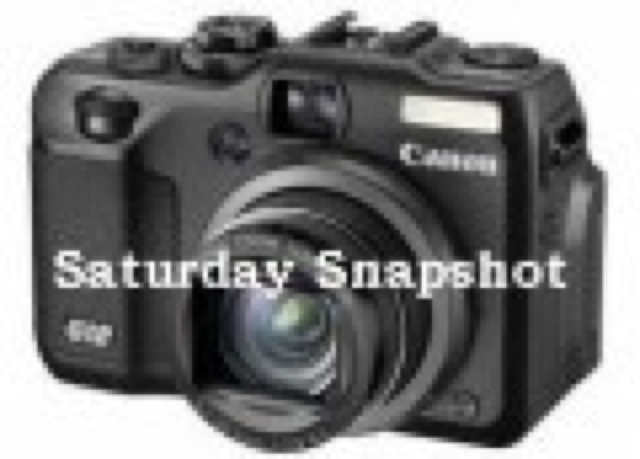 Feel free to grab the image and link your post below. 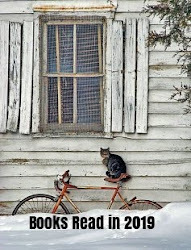 This week I'm featuring an intro from a book that has been on my shelf for a while, and is also on my 2013 Bucket List. "I do not love mankind. Every retiree you meet wants to supply you with his life story. An example, thirty-five years ago a woman came into the library. She had just heard about oral histories and wanted to string one together for herself." What do you think? Would you keep reading or move on to something else? Want to join in? 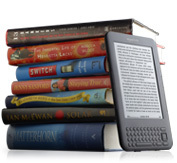 Get any new books last week? Share your latest acquisitions with other blog readers by joining in on Mailbox Monday. The host for March is Caitlin at Chaotic Compendiums. Hope everyone has had a good week. 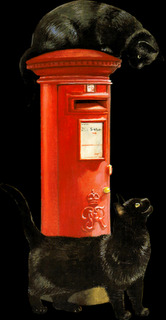 I've haven't spent much time blogging or reading blogs this past week but hope to catch up this week. Here's a little summary of how my week went. We started last Sunday with our family, multi-birthday celebration which included a healthy chicken dish, salad, pizza and carrot cake, and yes we all indulged, but it was a bit of a reward as well as a celebration. 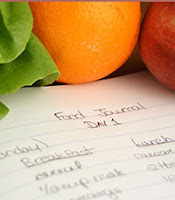 (4) of us have been involved in a eating healthy and weight loss program for the last (12) weeks. It isn't a competition, but we've all been doing well. The (4) of us have lost between (9 and 20lbs each) and about 60 lbs between us! I lost (15lbs) as of yesterday and have dropped almost (2) sizes in dress pants already, so I'm pretty excited. I'm planning on making this a permanent change to the way I eat moving forward, even after I reach my goal weight. 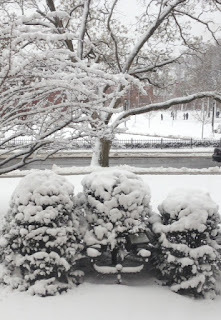 The weather has been all over the place here, as the daffodils have popped but the snow has not stopped. Still snow on the ground in places and more predicted. It was really cold and windy the past few days even though Spring has supposedly sprung. Edith can hardly believe it when she learns that Fadila, her sixty-year-old housemaid, is completely illiterate. How can a person living in Paris in the third millennium possibly survive without knowing how to read or write? How does she catch a bus, or pay a bill, or withdraw money from the bank? Why it's unacceptable! She thus decides to become Fadila’s French teacher. But teaching something as complex as reading and writing to an adult is rather more challenging that she thought. Their lessons are short, difficult, and tiring. Yet, during these lessons, the oh-so-Parisian Edith and Fadila, an immigrant from Morocco, begin to understand one other as never before, and from this understanding will blossom a surprising and delightful friendship. Édith will enter into contact with a way of life utterly unfamiliar to her, one that is unforgiving at times, but joyful and dignified. 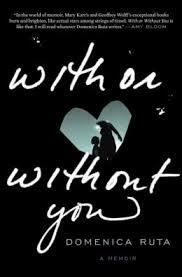 With Or Without You, is a memoir written by 33-year old Domenica Ruta who grew up in Danvers, Massachusetts. 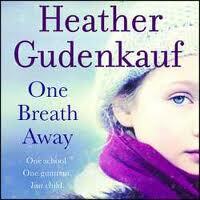 She was raised in an unstable environment with her unpredictable, drug addicted mother, Kathi. Kathi and her friends who came and went added to the chaos is in the home, were smoking, drinking and drug use were commonplace. Domenica (Nicki) loved to read at an early age yet rarely was a book to be found in the home, yet her mother ofter kept her daughter home from school so the (2) could watch movies together. 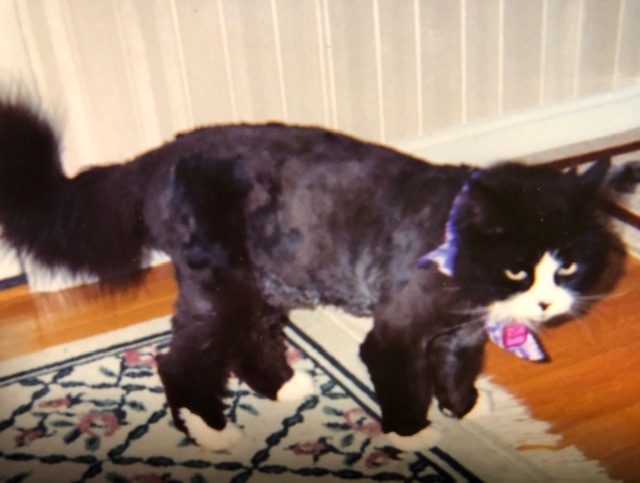 With a trash strewn house, people coming and going, friends were not easy to come by for Nicki, and once someone did come home with her, it was pretty understood, that would be a first and last time. Nicki vows early on never to grow up to be like her mother, but we all know that sometimes that is easier said than done. Despite being raised in poverty, her mother always wanted more for her daughter, and despite the home environment Kathi created, it was clear she loved her daughter. Often when their welfare check would come in, she would insist on spending some of the money on a "designed outfit" for her daughter. She was also determined to find a way to send her intelligent, daughter to Catholic school, because the public schools in their blue-collar town were substandard. She even found ways to get her daughter interviews at the best private prep schools, which eventually led to acceptance at one as well. Kathi's goal for her daughter was that she would get to meet wealthy, cultured people her age, and see how other people lived. At one point Kathi even manages to rise above poverty, buy a home and even to run a successful business for a while. This memoir seemed brutally honest, yet parts seemed hard for me to fathom. 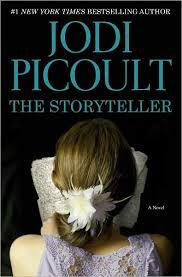 The story held my interest and even made me laugh at times, yet the writing seemed scattered at times. Although my childhood was far from ideal, it's hard to imagine growing up in this situation and rising above it all. Well written and recommended. Arriving just before Easter, this book is awfully cute. 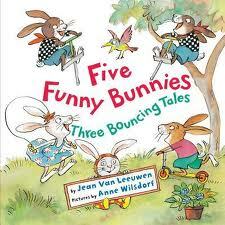 It's actually a book with (3) separate stories featuring the same bunny family that will amuse the (3+ age group). One story features a mother Rabbit and her little ones baking a pie for their grandmother when something silly happens on their way to deliver the pie. Another story involves the bunnies engaged in all sorts of outdoor fun. Like children, each bunny is trying to show off in the process. 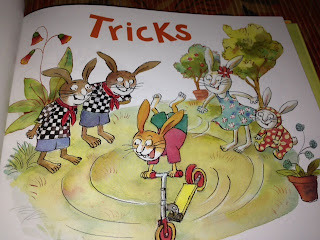 The other story is the perfect bedtime treat as the bunnies try to stall and stay up just a little bit longer, again just like little children try to do. While the stories are fun, I thought it was the illustrations that really made this book special. Both colorful and whimsical, you'll want to study each page and point out cute details to the special little one in your life. 4/5 stars - Worth checking out! 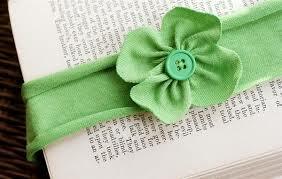 This week I'm featuring an intro from a book by a favorite author. I started listening to the audio version this week and am enjoying it. "On the second Thursday of the month, Mrs. Dombrowski brings her dead husband to our therapy group. I stand frozen, ducking my head so that my hair covers the left side of my face, like I usually do. I’m sure there’s a protocol for meeting a spouse who’s been cremated but I’m pretty much at a loss. Am I supposed to say hello? Shake his handle?" Hello Sunday Saloners, I haven't participated in SS for a little while, but I have some catching up to do so this seemed like the perfect venue. 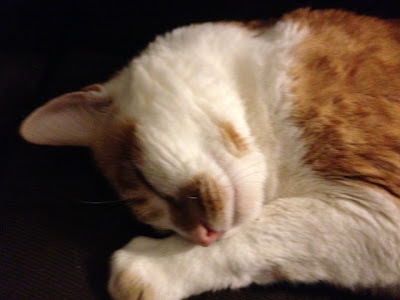 The past week was a bad week for some of the cats in our family. 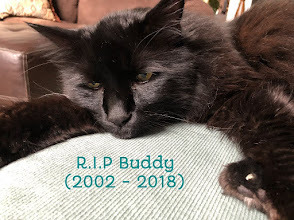 First, it was time for my son and his wife to say goodbye to their 20 year old cat Psycho. He entered our family home as a kitten in 1993 and then moved on to be just my son's cat in 1997 when he got his own place. They were together ever since. Hard to say goodbye, but he had been going downhill quickly and had a stroke and couldn't walk this past week. Goodbye Psycho, you were a sweet boy. 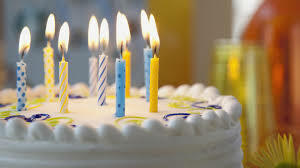 Birthdays - February and March are banner birthday months for our family (5 of them: my husband, son-in-law, sister-in-law, daughter and daughter-in-law). Just me, my son and the littlest of the group have birthdays in the other (10) months. So later today well get together to celebrate over food and cake. 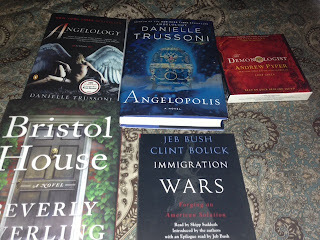 Reading: I've been reading up a storm, but reviewing at a turtle's pace. Hope to catch up soon. Wishing everyone a special Sunday. 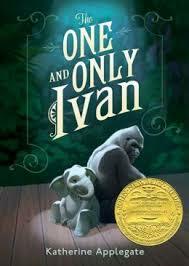 The One and Only Ivan is a story about an extremely brave and courageous silver back gorilla; his name is Ivan. Ivan and his twin sister were captured as babies in the wild and taken away with the intention of having both live behind bars somewhere. His sister never made it, she died in transport, and Ivan ended up as a store front gorilla behind glass and bars at the Big Top Shopping Mall. For years Ivan lived with his friend Stella the elephant there but over the years, business has dwindled and Stella has a bad foot and can't perform like she once did. The owner of the mall, Mack, decides to bring in a baby elephant to help business; her name is Ruby. 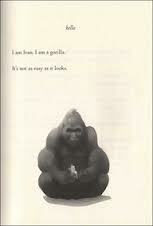 Ruby was taken from the wild just like Ivan. Ivan makes a promise to Stella that he intends to keep, a promise of a better life for Ruby, the new arrival at the mall where he lives. Through his artistic ability and with help from a special little girl, he may just be able to keep his promise and help them all. The story is told by Ivan and he shares what he has learned about life and humans over the years. His voice is pitch perfect, and although it is sad in parts, it can make you chuckle as well. It is a story that will make even young readers (8+) think about what is really best for animals, and it will make older readers think twice about some of Ivan's observations about us humans as well. 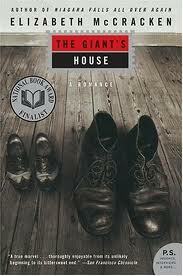 I loved this story and thought it was tastefully done and award-worthy. The author does not come across too strong as an animal right's activist, but through Ivan's observations, most of which are spot on, not much more needs to be said. "I've learned to understand human words over the years, but understanding human speech is not the same as understanding humans. 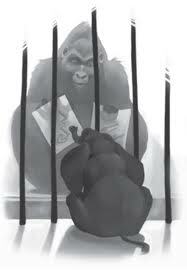 Patient is a useful way to be when you are an ape. Gorillas are as patient as stones. Humans, not so much." 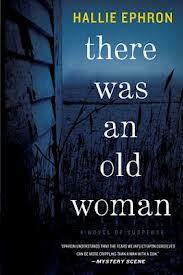 There Was an Old Woman by Hallie Ephron was a somewhat creepy, psychological mystery, that hooked me early on. The story begins when an older woman by the name of Sandra is taken from her home by ambulance. She's an alcoholic and for her, it's not her first time being hospitalized, but this time she seems worst than ever. Across the street from Sandra, lives Mina, an independent, spry lady of 91. Mina is the neighbor that contacts one of Sandra's daughters to let her know that her mother has been taken to the hospital. When Evie, one of Sandra's daughters, arrives at her mother's house after not having visited the home in a while, she is shocked by what she finds. The house is packed with clutter, trash and even cat food cans (think TV show Hoarders). However, mounted on the wall is a big flat screen television, and she also finds lots of envelopes filled with hundred dollar bills that can't be explained. Upon further checking into her mother's affairs, she notices that a hefty credit card bill has been paid off, yet no money is missing from her mother's bank accounts. On top of this strange things are happening in the neighborhood, and she learns through hospital staff that it may have not been just too much alcohol that caused her very very ill mother to be hospitalized. As Evie spend more time cleaning up her mother's house, she gets reacquainted with Mina, her former neighbor. In the process, she learns more strange but interesting information. What is going on in this Bronx neighborhood, and are the elderly being targeted? The story is told by both Evie and Mina, and although it's slightly creepy at times, it's also well written. Mina was one of those characters I thought about even after I was done --she still lingers. 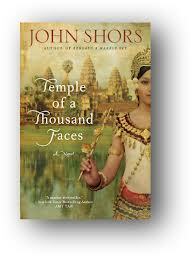 The story is written in a way that makes you want to finish this one in one sitting if time allows. I thought it was an enjoyable read. In Charles Dubow's debut novel, Indiscretion, the title says it all! Yes,the topic of infidelity rears its ugly head once again in the world of fiction. Despite a frequent theme in fiction these days, this book was somewhat different. It was well written, engaging and had an unpredictable ending. Harry and Maddy Winslow seem like the perfect couple and together with son Johnny they have a wonderful life. New Yorkers, with a summer home in the Hamptons, Harry is a successful author, and Maddy is financially independent, gorgeous, a domestic goddess in the kitchen, and they are still in love after many many years. The couple loves spending summers out in the Hamptons and entertaining for a close circle of friends. All that is about to change when one weekend Harry rescues 26 year old Claire while she out on the beach alone. Claire is visiting nearby with a friend. She is immediately attracted by the older, handsome, well built Harry. The two meet again when an invitation to her friend gets Claire an invite as well to one of their social functions. Claire gets to meet Maddy, Harry's wife and the three hit it off, but for Claire her attraction is definitely Harry, she can't seem to stop thinking about him, and her attraction proves disastrous all around. Even a trip for Harry and Maddy to Rome for several months where harry plans to work on his book, isn't a guarantee of keeping Claire away. The story is told through Walter, an attorney and a childhood friend of Maddys. It's fast paced, well written, sensual in parts, the characters are multi-dimensional, and the ending packs a wallop as well. 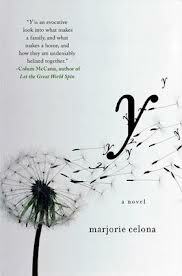 The story is a great expose on marriage, betrayal and friendship. It's also a story without a predictable ending. Well worth reading - I liked it. Favorite Quote - "Victor Hugo wrote that the supreme happiness of life is the conviction that we are loved, but that conviction is based on an assumption of such love. If we are proven to be wrong, the void left behind is often filled with resentment and rage. Hugo could have written that the supreme unhappiness of life is discovering that we are not loved. It is one thing if we already suspect the absence of love in our life, but what truly crushes us is finding out that the love we cherished was a lie." is hosted by Alyce of At Home With Books. 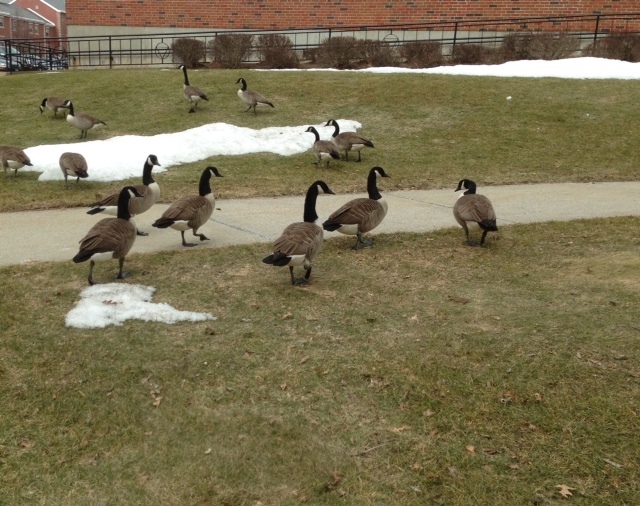 The geese aren't happy, but the view outside of my window at work sure was pretty yesterday. 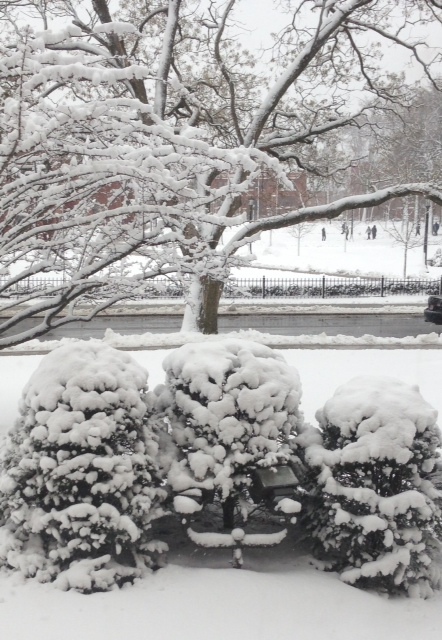 Today and tomorrow it'll be 50 degrees so we should be back to the first photo soon:) That's New England weather! Sometimes I just get so overwhelmed by too many books and too little reading time, and before I know it another month has passed and the new releases I meant to read remain in my TBR pile. It's frustrating to see them pile up like that. So I decided feature, on an ongoing basis, some new releases which came my way that I think sound pretty awesome. By getting the word out about these books, maybe some of you will want to add them to your lists as well. Maybe some of my readers have already read these, if so what did you think about these? 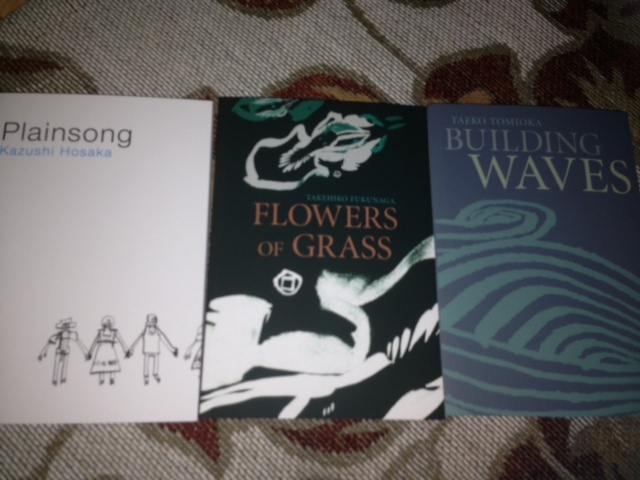 Here's some of my picks for for January, February and March of 2013. When Dad Lewis is diagnosed with terminal cancer, he and his wife, Mary, must work together to make his final days as comfortable as possible. Their daughter, Lorraine, hastens back from Denver to help look after him; her devotion softens the bitter absence of their estranged son, Frank, but this cannot be willed away and remains a palpable presence for all three of them. Next door, a young girl named Alice moves in with her grandmother and contends with the painful memories that Dad's condition stirs up of her own mother's death. Meanwhile, the town’s newly arrived preacher attempts to mend his strained relationships with his wife and teenaged son, a task that proves all the more challenging when he faces the disdain of his congregation after offering more than they are accustomed to getting on a Sunday morning. And throughout, an elderly widow and her middle-aged daughter do everything they can to ease the pain of their friends and neighbors. 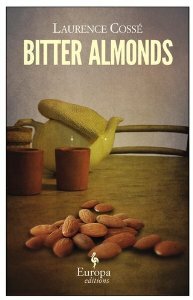 An Amazon Best Book of the Month, March 2013: It can’t be easy to sit down and write a new novel after your last, Olive Kitteridge, won the Pulitzer Prize (in 2009). The pressure! The pressure! 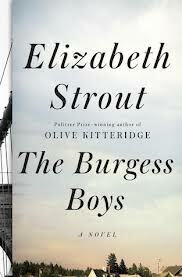 In The Burgess Boys, novelist Elizabeth Strout somehow manages to survive whatever next-book anxiety while at the same time revisiting the themes and types of characters that have made her famous: plainspoken Mainers (some transplanted now to Brooklyn) bound together by both love, competitiveness and the issues of the day. Here, hotshot lawyer Jim and bighearted Bob Burgess come together over a politically incorrect prank perpetrated by their sister’s son--and discover that their distrust of each other has never really gone away. But then, neither has their love. Nobody does buried conflict and tortured familial relations better than Strout. Jill McCorkle’s first novel in seventeen years is alive with the daily triumphs and challenges of the residents and staff of Pine Haven Estates, a retirement facility now home to a good many of Fulton, North Carolina’s older citizens. Among them, third-grade teacher Sadie Randolph, who has taught every child in town and believes we are all eight years old in our hearts; Stanley Stone, once Fulton’s most prominent lawyer, now feigning dementia to escape life with his son; Marge Walker, the town’s self-appointed conveyor of social status who keeps a scrapbook of every local murder and heinous crime; and Rachel Silverman, recently widowed, whose decision to leave her Massachusetts home and settle in Fulton is a mystery to everyone but her. C.J., the pierced and tattooed young mother who runs the beauty shop, and Joanna, the hospice volunteer who discovers that her path to a good life lies with helping folks achieve good deaths, are two of the staff on whom the residents depend. 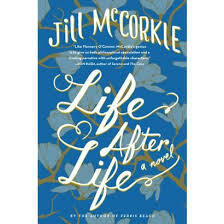 McCorkle puts her finger on the pulse of every character’s strengths, weaknesses, and secrets. 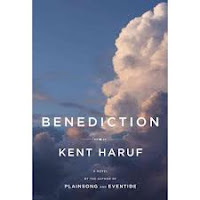 And, as she connects their lives through their present circumstances, their pasts, and, in some cases, their deaths, she celebrates the blessings and wisdom of later life and infuses this remarkable novel with hope and laughter.